The name came up in 1930s by American physiologist Royal H. Burpee, who developed the so called burpee test – part of his PhD thesis which was a quick and simple way to assess individual’s overall fitness. He was right. They test our aerobic capacity, indomitable will and much more. 1. Drop down, get back up: it’s a vicious cycle. In general, Crossfitters simply just don’t like them. Often the reason lies in their “how-to” simplicity: the movement begins in a standing position with you feet shoulder width apart. From there on you drop down to the bottom, body flat to the floor, chest and tights need to touch the ground. Next phrase is getting back up by pushing with your hands (push up), keeping the core engaged (don’t break the lower back) and pulling your feet back to your hands (snap moment). When your feet are back solidly on the ground, you jump to reach the full body extension and clap with your hands above the head. Drop down. Get back up. Burpees. Bottom position: The chest and tights both have to touch the ground. Upper position: contact with the target above you, or jump over the barbell. 2. They never come in numbers 3 or 5, always 50+. Filthy 50, Athlete Games qualifier, The Don, etc. Even when you calculate the numbers in usual MetCons, remember 14.5 with thursters, you get numbers over 50. They are here to test your overall conditioning and lung capacity. So if you’ve been hitting those weights too often and missing out on your endurance sessions, you’ll have a hard time with burpee MetCons. Also, heavier athletes might get a glimpse of bodyweight providing more than enough resistance needed for a good intensity. Always come with 50+ reps.
3. And if they come with -5 reps, it’s called Kalsu, one of the hardest WODs ever. Five burpees each new starting minute until you complete 100 reps of thrusters, barbell loaded with 61 for men and 38 kilos for women. Kalsu is a Hero WOD, dedicated to Robert James “Bob” Kalsu, former professional football player who left his sport career behind to serve his country in the Vietnam war. We talked more about it in one of the previous articles: Kalsu and 100 Thrusters: the Hardest WOD Ever? The workout starts with 5 burpees and continues with the maximum reps of thrusters for the rest of the minute. Each new starting minute you repeat the burpees until all 100 thrusters are done. 4. They come in various shapes and sizes: with walls, boxes and even back flips. A simple movement can often be adjusted, so the workout gets a higher intensity. So far we have seen them done on walls, box jumps, dumbbell burpees step overs, partner wall balls burpees and jump over the rower burpees. Probably a lot of ideas stayed hidden. When the creativity kicks in you’ll also find hang snatches with burpee backflips and more. 5. Almost done with WOD, then burpees come in as the last exercise. You know this feeling when you’re already done with box jumps, pull ups, kettlebell swings, knees to elbows, etc., and then the burpees come in as the last exercise? We’re talking about Filthy 50 here and it marks the point when the simple movement becomes complicated. How you feel at the end of the Filthy 50. You are already tired, almost see the goal, but there are 50 burpees to finish. Talking about the mental game? 6. It’s a mental game where you can learn how to pace. Rich Froning gets most credits for having an extremely great insight into his body-mind connection, meaning he knows his body and mental prep so well, he can come up with a pacing that makes him last, often even speed up throughout the workouts. Each individual has it’s own pace. 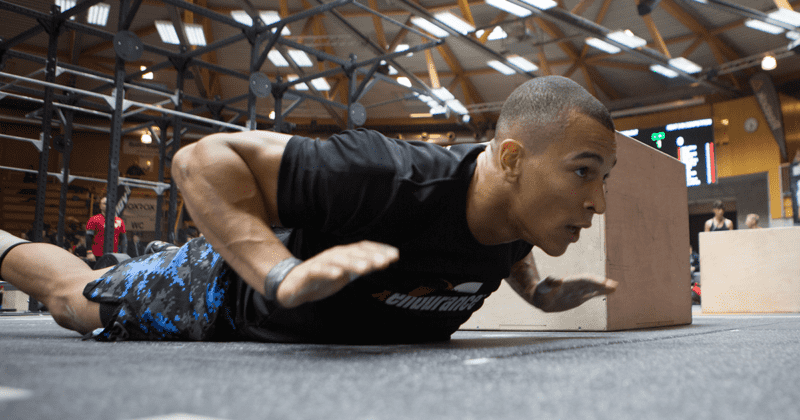 Burpees as part of the Crossfit MetCons need good pacing and solid focus which don’t get disturbed by the repeated, vicious cycle of dropping down, getting back up. Those kinds of workouts are a great way to get to know yourself a bit better: how you body responds, how you mind wanders, what is a good pace? Each individual has its own pace, and shouldn’t keep up with others, just to start fast, but end up drained before the workout ends. So keep your head up next time you see burpees on the whiteboard. Which reason did we miss out?